Pungent smoke from a campfire drifts across the battlefield, bringing with it the smell of stew cooking in a big iron pot. In the distance, a musket fires and red-coated men shout, “Huzzah!” The steady sound of marching feet draws closer. A cannon roars, spitting smoke and fire, and the whole crowd cheers. It's January 1815, and the stage is being set for the Battle of New Orleans. 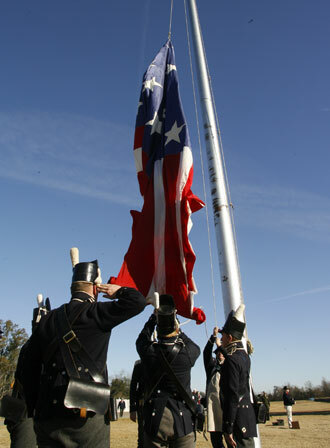 It's also January 2012, and history has come to life at Chalmette Battlefield, site of the Battle of New Orleans, the final battle of the War of 1812. 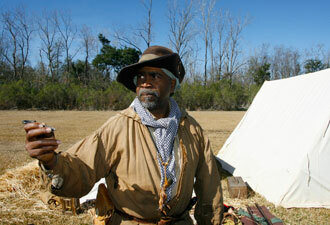 Every January, living history experts around the country head to Chalmette, just downriver from New Orleans, to pitch tents, don uniforms, and step back in time. This January's Battle of New Orleans anniversary event is set for Friday and Saturday, January 6-7; a wreath-laying ceremony to pay tribute to the battle's troops is scheduled for Sunday, January 8. The usually quiet battlefield comes alive with color, action, and noise during the anniversary: drums beat, muskets and cannons fire, and visitors mingle with generals, camp followers, and pirates. Listen in as Major General Andrew Jackson consults with a colonel from the 7th US Infantry Division. A member of New Orleans' free men of color battalion might stop you, asking for news from the city. Jean Lafitte's Baratarian pirates will make room at their campfire for you, bragging that their cannons will silence any British soldier who shows his face. Civilian women chop vegetables for the noonday meal, reminding onlookers that an army marches on its stomach. Over in the British camp, you can look over the shoulder of Major General Sir Edward Pakenham as he studies a map. Soldiers in Highland tartan plaid trousers stand at attention as an officer explains the tactics his men will use when the final battle begins. During the rest of the year, it's up to your imagination to create the scene, but there's plenty of fuel on hand to light the fire in your mind. 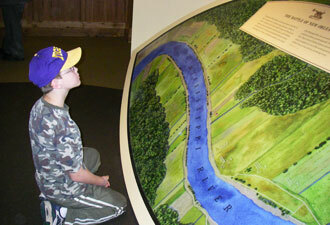 The visitor center features two films, a model of the American rampart, period weapons, and interactive exhibits where you can explore topics from artillery firing to the hardships soldiers faced. The cannons that line the partially reconstructed rampart, daily ranger talks, wayside signs, and a cell phone tour help you picture the battlefield on that historic day nearly 200 years ago. Just for a moment, 1815 will live again. Chalmette Battlefield, near New Orleans in Chalmette, Louisiana, is one of six sites managed as part of Jean Lafitte National Historical Park and Preserve. Admission and most programs are free throughout the park. Virtual visitors can follow the experiences of local high school students who portray soldiers and camp followers in the “Recognizing Our Roots” program.